Maine is one of the New England states of the US West Quoddy Head, a small peninsula in the SE, is the easternmost point of land of the US. 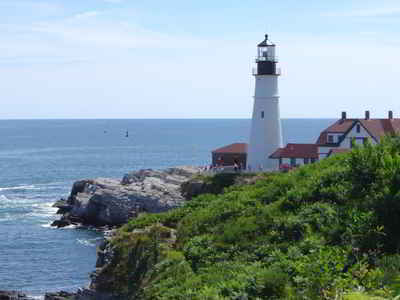 Maine is the 41st most populous state of the 50 US states. Maine is a state in the New England region of the northeastern United States, bordered by the Atlantic Ocean to the east and south; New Hampshire to the west; the Canadian provinces of Quebec to the northwest; and New Brunswick to the northeast. Maine is both the easternmost and northern most point of New England region located in the northeastern part of United States. 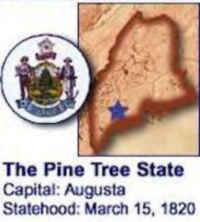 Maine's name was first used to distinguish the mainland from the offshore islands. It has been considered a compliment to Henrietta Maria, queen of Charles I of England. She was said to have owned the province of Mayne in France. Maine produces 98% of the nation's low-bush blueberries. Farm income is also derived from apples, potatoes, dairy products, and vegetables, with poultry and eggs the largest selling item. Manufacturing began to play a leading role in the Maine economy in the late 19th century. In the early 1990s the chief fabricated items were forest products, transportation equipment, electronic items, leather goods, apparel and textiles, and processed food. Tourism also is an important industry, and the state's extensive fisheries are noted for producing lobsters. Maine's climate is highly changeable -- it can go from sunny to stormy in short order. Generally, summers are cool, with highs in the upper 70s or low 80s F/24-27 C. Some summers have days that get above 90 F/32 C; some don't. Interior areas experience a greater range of temperatures in the summer, with some nights in northern areas at or near freezing. Winters in Maine are cold but not frigid. January temperatures range 11 to 31 F/-12 to -1 C along the coast and 1 to 19 F/-16 to -7 C inland. Snow melts frequently along the coast. Maine offers countless things to see and do, regardless of the time of year. Popular outdoor activities include fishing, kayaking, sailing, skiing and snowboarding. In addition, visitors will thoroughly enjoy Maine's historic sites, homes and museums. Some of the state's busiest attractions include Acadia National Park, coastal fishing villages and lighthouses, Baxter State Park, the historic buildings of Augusta, Bar Harbor, Allagash National Wilderness Waterway, the Wadsworth-Longfellow House in Portland, Roosevelt Campobello International Park, and the St. Croix Island National Monument. and much, much more. 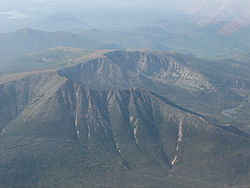 Katahdin is a huge mountain with several summits. Baxter Peak, the 5,267 foot high point, is the northern terminus of the Appalachian Trail. A narrow ridge called the Knife Edge connects Baxter Peak to South Baxter Peak, Chimney Peak, and Pamola Peak. Total Area 35,384.65 sq. mi. Land Area 30,861.55 sq. mi. Water Area 4,523.10 sq. mi.